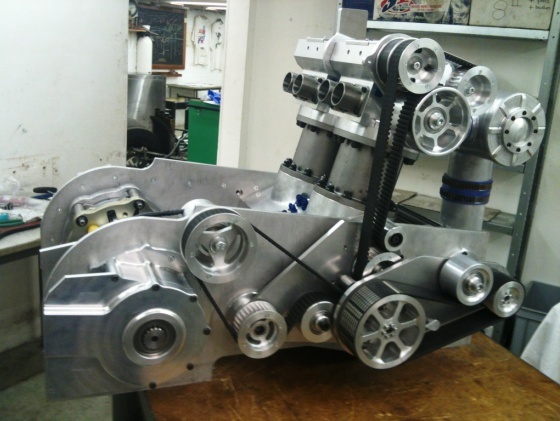 Puma Engineering have completed the engine and pod assembly of their unique blown parallel nitro twin for delivery to its new owner, Norwegian rider Hans Olav Olstad, where it will be fitted in the previously supplied rolling chassis. 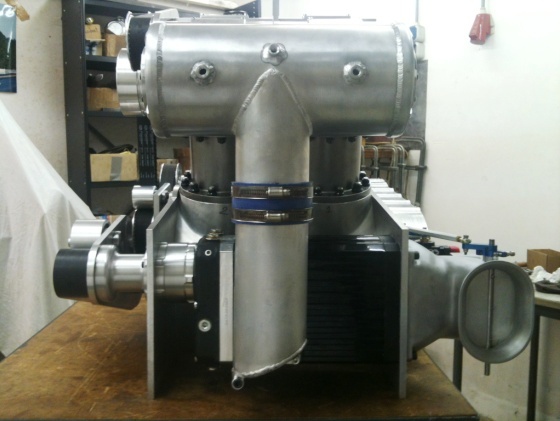 The engine is a 4.5″ (114.3mm) bore and a 3.23″ (82mm) stroke, 102.7 cu/in (1683cc) DOHC 4 valve per cylinder parallel twin. The barrels and heads are separate from each other (unlike Per Bengtsson’s `Beast’ parallel twin) and the crank is effectively two individual single cylinder cranks co joined by a spline and sleeve assembly. Another unique aspect is that the primary drive is gear driven, rather than the more usual belt and pulleys. It is hoped that the bike will be on track for the first time at the season opening European Dragbike Championship round at Santa Pod on Jubilee weekend. Puma Engineering is owned by Gulf Oil Dragracing Team Principal Ian King and former Nitro Supertwin rider Gerard Willemse. Founded in 1972, over 100 Puma engines have been built for Top Fuel and Funnybike applications and Puma powered motorcycles have broken numerous US, European, Australian and World records over the years on the way to a multitude of championship titles, more than any other engine in Top Fuel Dragbike history. With power outputs of around 1500 HP / PS under 1500cc, Puma engine powered bikes are used in US, European and British Championship winning bikes, and hold the accolade of propelling riders Larry McBride and Korry Hogan to the quickest (5.746 seconds) and fastest (250.97 mph) quarter mile standing start runs in history by a piston driven motorcycle. 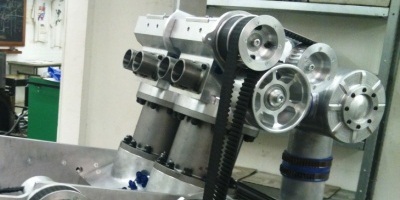 four valves per cylinder pro stock heads could be the fashion in nhra p.s. motorcyle drag racing. the new top fuel puma motor seems very practical!